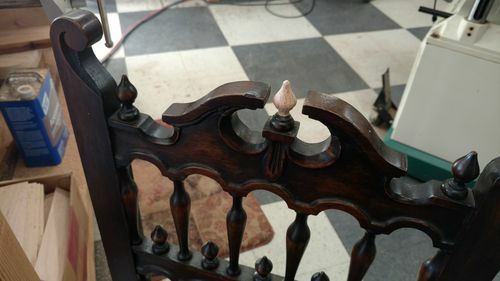 It took a few efforts, but I was able to turn replacement finials for my client’s antique chairs. The first few attempts were close in shape to Christmas light bulbs. Comparing them side by side, I could see that the shape I really wanted was more like a candle flame. I made two with tenons that fit into existing mortises. (The original finials came loose some time in the past and were lost.) A third had broken off at the waist and the client wanted to save as much of the original as possible. 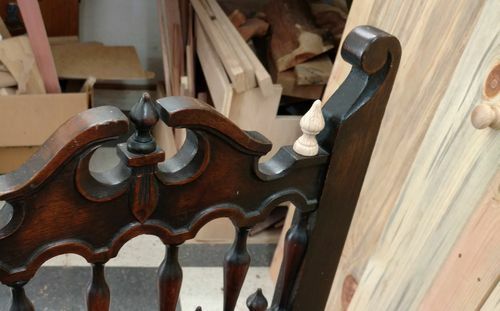 For that, I created a partial finial and used a toothpick as a dowel to hold it in place. I tried to make these on my full-sized lathe—the first time I’d needed it since removing the stuck chuck (with excessive force). I didn’t think any damage had been done, but in twisting the chuck free, I apparently bent the drive shaft in the headstock. I could feel a vibration with a workpiece between centers. Watching it run with a faceplate in place, the wobble was pronounced. Needless to say, a delicate part like this just came apart while I turned it. I used my mini-lathe for this job. A new lathe was not in the budget for this year, but a drum sander was. I looked at a few mid-priced lathes from Grizzly, but they were all back-ordered, some not expected to ship until mid-summer! I found a Nova, their model 1624, with good reviews and put one on order. I hope to have it by the first of February. Good luck with your new lathe. Post a review when you get some experience with it.